How long have you been stamping? I started card making while waiting to have both knees replaced in 1997. The only craft I had heard of was Parchment Craft. I have dyspraxia which means I have trouble with precision. This was quite the wrong craft for me. Next I tried tea bag folding. I still have a huge interest and love of this craft and run my own group. I wasn’t going to take up stamping as it was too expensive and you needed too much stuff! What is your favorite technique? This changes from week to week. I like to experiment with techniques with friends. The messier the technique the better. What are your favorite colors to work with? What are your favorite Asian stamp images? Sorry there are too many to list. What is the one tool you couldn’t live without? My Tim Holtz ruler – so easy to use and in inches! Any helpful tips for the group? As a member of OSA, why do you like stamping in the Oriental theme? I enjoy the challenge and never ending possibilities the Oriental theme offers. What favorite stamping magazines would you recommend and why do you like them? There are a lot of good UK magazines for general card making. I don’t know of any that specialize in oriental art. Generally I subscribe to a different magazine each year. For 2014 it is Simply Cards and Papercraft. I pick up other magazines if I want the freebie. such as a stamp set or printed papers. Published in any magazines? If yes, please list. 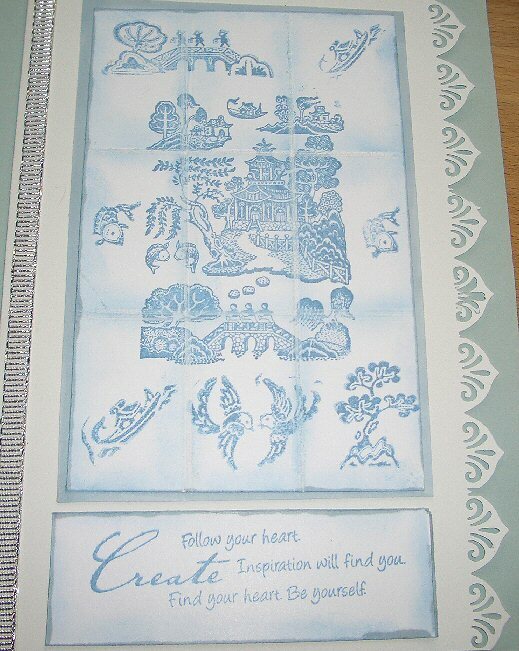 My biggest success was in Craft Stamper March 2007 when they featured the Oriental Stamp Art swap I hosted. 15 members of OSA had their swap cards shown in glorious Technicolor with large photographs. I have had several articles published in the Craft Creations Magazine mostly on teabag folding. I am best known for my first teabag fold called leofold. I have had short stories, puzzles and poems published too. Any other hobbies, talents or craft interests? I love reading, card making and walking my dogs. What inspires you to be creative? It could be a picture in a magazine, a card received or just an idea that popped into my head at 4 am. If that happens I want to make that card so much that I might well get up and start it in the middle of the night! A deadline helps to make me finish a card and get it mailed out. Any favorite websites you would recommend for inspiration? OSA and members’ blogs. I am having trouble with my eyes so I tend to choose making a card rather than reading online. Do you have a day job when you’re not stamping? I am retired teacher/ librarian. Tell us about your family and where you live. My husband and I live in a village and overlook a canal. We used to own a canal boat. . Dave is frail so our life has narrowed and card making helps me to cope . We have a son, a grandson and, of course, two dogs. •Fold an A4 sheet of card in half. •Punch a border on the right-hand side of the card. •Put this card base aside for now. •Next you need good quality stamping type card 3 and 3/4″ by 6 “. •Stamp your main large image. I used distress ink faded jeans and Blue Willow by Kodomo. •With the short side of the card at the top, score at 1 and 1/4 ” and at 2 and 1/2 “. •With the long side of the card at the top score at 2″ and at 4”. •You have made faux tiles. •You are going to sponge around each tile trying to avoid the scored lines which represent grouting. 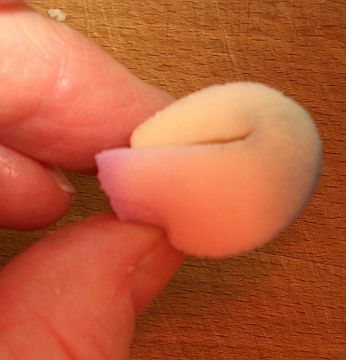 •Use the same ink as you stamped with – make a piece of sponge into a ball. •Cover the scored line with a post it note. 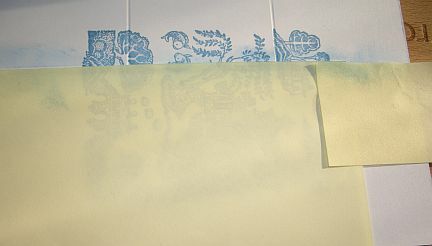 •Tap the sponge on to scrap paper to remove excess ink and work from the Post-it Note to the tiles. •You can sponge right across the card. •Starting to sponge the middle of the tiles. •I scored again to deepen the grouting lines and ran a white pencil over the lines to emphasize them. 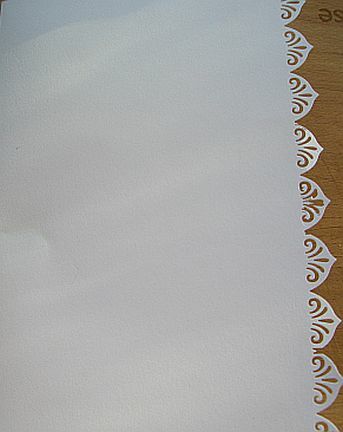 •Now assemble and embellish the card as you wish. The sentiment is from Treasure the Moment by Hero Arts. 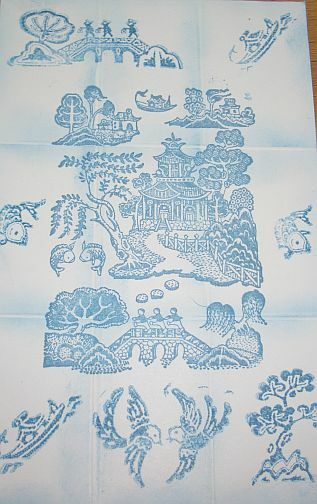 There are many versions of the Willow Pattern story. 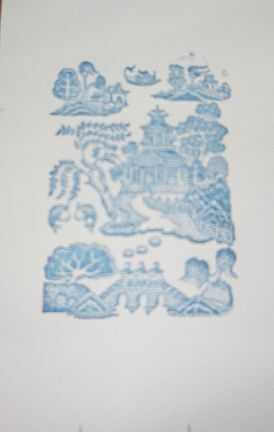 In order to promote sales of Minton’s Willow pattern, various stories were invented based on the elements of the design. Here is the story as quoted from my Komodo Inc., Blue Willow rubber stamps. “Long ago in Ancient China, a powerful nobleman lived with his beautiful daughter in a palace surrounded by gardens with fruit trees and a willow tree. The girl had been promised in marriage to another but she fell in love with her father’s clerk – a commoner. The clerk was fired and they were forbidden to see each other. A zigzag fence was built around the estate so he could not enter. However, one night they escaped across a bridge with the father in pursuit. A huge Congratulations, Leo! I love your beautiful project and the step-by-step tutorial…you always make such beautiful cards! Enjoyed reading your profile and learning more about you…enjoy your month in the limelight as OSA Artist of the Month! Congratulations, Leo. You definitely deserve this honor. Congratulations Leo! Your project is fabulous…a great technique! Congrats to you, Leo – you certainly deserve to be an SAM! Beautiful card – haven’t done this tech before, but your directions are very explanatory and easy to follow! Wonderful article Leo. Congratulations to you. It is a great card and your explanation is easy to follow. I truly enjoyed reading about you. Leo, how wonderful you agreed to be OSA’s March SAM. 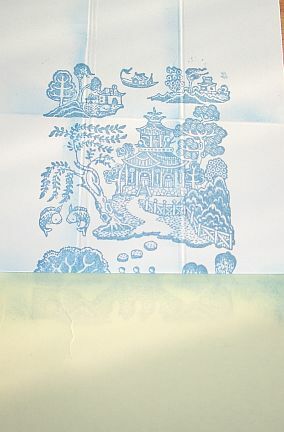 Congratulations and thanks for showing us this terrific technique and story of the willow pattern. 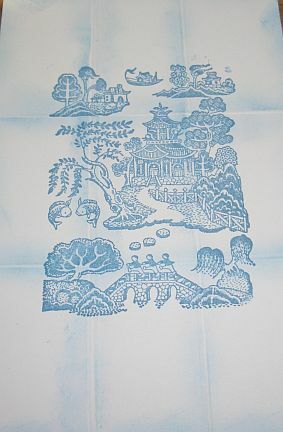 Blue is my favorite color thus the blue willow pattern is also a favorite and your project displays it so well. Lovely card. Congratulations on being SAM. Lovely card and very clear instructions. Thanks for sharing Leo. This is so delicate and beautiful. I love this technique! Congratulations on being chosen as SAM, a well deserved honour! Great to read your bio too and get to know you a bit more! Enjoy your month in the limelight! 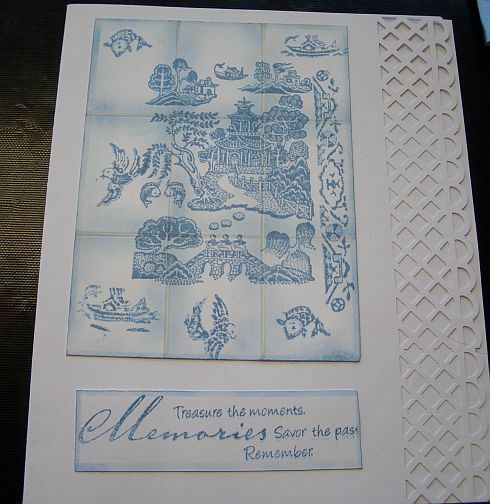 Your Blue Willow tile card brings back memories of my Mum’s china. Thanks for the great tutorial and enjoy your month as SAM….. Huge Congratulations to a wonderful stamper and friend. Leo, your work always amazes and inspires me.. Great honor to have been chosen as OSA’a March SAM! Love the card! And I love Blue Willow!! Where did u find the stamp? I am having trouble finding the stamp on the Internet. Anna I don’t know if it is possible to find these stamps now unless they are second -hand eg of ebay.